Virginia Cruise Deals - Cruise For Less! Looking for cruise deals? Want a fantastic cruise experience without paying an arm or a leg? Virginia offers a dazzling array of cruises, ranging from Bermuda itineraries, to Chesapeake Bay cruises, to cruises touring the largest naval base in the world. We took a 7-day Carnival cruise to the Bahamas from Baltimore. No airfare needed! And with Virginia being within a day's drive of much of the Eastern seaboard, it's a perfect way to get the cruising experience without having shell out airfare too. Thanks to the new Norfolk, Virginia cruise terminal, cruise deals to Bermuda have never been cheaper for those living in the Mid-Atlantic region, and if you can travel last minute, your savings could be huge. After a one-year absence, Carnival Cruise Lines has announced several 2019 cruise departures from Norfolk. 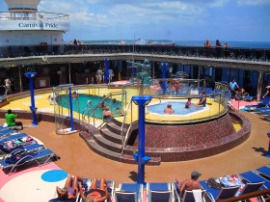 They include 5 and 6-day cruises to the Bahamas, visiting Nassau, Half Moon Cay, and Freeport on the Carnival Triumph. Here are the details and 2019 dates. How about an 8 day/7 night Carnival cruise to Bermuda for only $599? 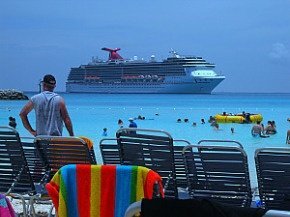 Vacations to Go, a travel site specializing in last minute cruise discounts (like a few weeks or months out), recently advertised a week-long cruise departing from Baltimore on Carnival's Carnival Pride in September. The itinerary includes Port Canaveral, and Freeport and Nassau in the Bahamas. Prices started at $599 for an inside cabin. Royal Caribbean also regularly offers a Bermuda itinerary from Baltimore, which includes stops in Hamilton and St. George's, Bermuda. You can also get similar itineraries to Bermuda or the Bahamas from Norfolk. An 11-night cruise that goes to Labadee, a private island in Haiti, San Juan, Puerto Rico, St. Thomas and St. Kitts in the Virgin Islands, and St. Maartan in the Netherland Antilles. Price? $699 for an inside cabin through www.vacationstogo.com! Prices are US dollars per person, based on double occupancy, subject to availability, and include port charges, but not airfare, airport and government taxes or fees (if applicable). What could be more relaxing than a cruise that doesn't cost an arm and a leg? For details, call 800-338-4962 or go to www.vacationstogo.com. Before and after your cruise, why not see beautiful Norfolk? You can visit Nauticus, the USS Wisconsin, the Chrysler Museum of Art and the Virginia Zoo, go on a mermaid scavenger hunt, browse charming antique shops, sample great restaurants (like our favorite, Bakers Crust) and more. Click here for what not to miss in Norfolk, Virginia Beach, and beyond. If you're just looking for a day cruise, check out the Spirit of Norfolk. Enjoy an elegant dinner while you relax and enjoy views of the Norfolk Harbor and the Navy's Atlantic Fleet. To spice things up, your waiters may burst into song to accompany a DJ spinning top 40 songs. They offer theme cruises (such as Full moon, Meet the Princess, and Gospel), and a variety of holiday events, such as a Valentine's cruise and a New Year's Eve cruise. From time to time, they offer cruise deals. For example, they often offer Kids Sail Free deals on select dates in August. For more on Spirit of Norfolk cruises, and to see their latest cruise deals, click here. Connecticut-based American Cruise Lines honored Jamestown's 400th anniversary by adding Jamestown to its Chesapeake Bay cruise package. Jamestown is the site of the first permanent English settlement in the New World. 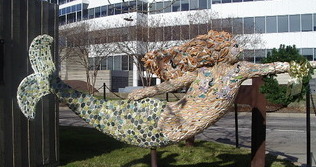 Go on a Norfolk "mermaid" scavenger hunt! The 49-passenger American Eagle, which starts from the port of Baltimore, also makes stops at Yorktown, Tangier Island and Annapolis, and tours the Patuxent River, Tangier Sound, and other destinations. The American Eagle has 31 staterooms with picture windows and satellite TV's, as well as four lounges and four decks. Unlike most cruise ships, which feature glitzy, casino-style entertainment, American Cruise Lines provide excellent cuisine and relaxation with a local, historical flair. Onboard activities include lectures by naturalists, historians, and other experts, who "bring the local history, nature and culture alive with their knowledge and passion for American heritage." Cruise deals rates for a 7-day, 6-night cruise range from $2560 to $3790 per person, and the season runs from June to November. For more information, see www.americancruiselines.com or call 800-814-6880. For information on what to see in Jamestown, click here.